ONLINE REGISTRATION IS NOW CLOSED. PLEASE PAY AT THE DOOR $75 WITH CREDIT CARD OR CHECK. Join or Renew this night for only $99! You must attend to receive this special price, but you can join & renew online with your ticket purchase. Details below. September 14 is a night of celebration of the jewelry industry, our relationships and our profession! Join us in New York City for Jewelry Night Out, our most popular event of the year that brings together nearly 300 of the jewelry industry's finest. Come and enjoy an open bar, great food and special guest author Rachelle Bergstein. The Women's Jewelry Association NY Metro Chapter has much more in store for guests! 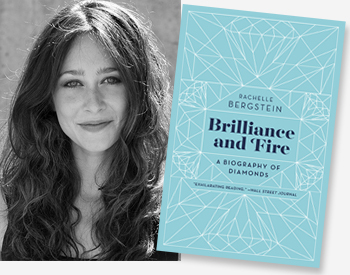 Rachelle Bergstein, the author of Fire & Brilliance: A Biography of Diamonds, will captivate guests with the often surprising story of our society’s enduring obsession with the hardest gemstone and the real-world characters who make them shine. $75 at the door. Pay by credit card or check only. Online ticket sales have closed. Tickets are non-refundable. Renew or Join tonight with ticket purchase for $99! For one night only, the Women's Jewelry Association brings together designers, retailers, editors, marketers, appraisers, salespeople, manufacturers and members of industry organizations gather to share in their passion for the work they do all year long. Networking is our mainstay and this night is our shining moment across the nation and around the world.